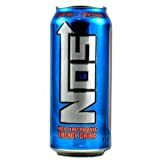 NOS Power shot is a concentrated form of the traditional NOS energy drinks. NOS PowerShot, 2oz, is aimed at those looking for very quick, high-impact energy. 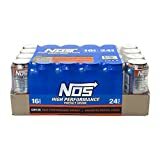 NOS PowerShot contains the NOS Maximum Boost Formula, which concentrates into one 2oz shot, serving the same level of Caffeine, Taurine, L-Carnitine, Inositol and Panax Ginseng found in an 8oz serving of regular NOS Energy Drink. Plus, NOS PowerShot contains a special formulation of elevated levels of Niacin, Vitamin B6 and B12 than those found in regular NOS Energy Drink. An 8 ounce serving of regular NOS contains 125mg of caffeine. 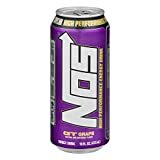 16 Pack - NOS High Performance Energy Drink - Grape - 16oz. How Does NOS Powershot Compare? NOS Powershot contains 62.50 mgs of caffeine per fluid ounce (211.34mg/100 ml).